Was Noah’s Flood a tsunami caused by a comet impact? In other words, HIWG says that Noah’s Flood recorded in the Bible was a tsunami caused by a comet impact. Therefore, astronomers are generally sceptical because according to their data, which they assume is representative of past frequencies, an impact equivalent to a 10-megaton explosion only occurs once in 500,000 to 1 million years (using uniformitarian assumptions, of course). 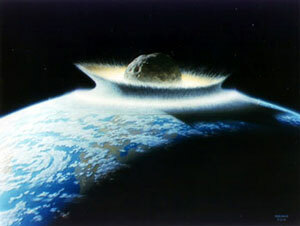 Some creationists have speculated that comet impacts were much more common at certain times in the past, especially during the Flood.3,4 However, these ideas are also speculative and would require more evidence than we have at present to be established as plausible.5 Based on the biblical and geological evidence, creationists also view the Flood catastrophe as orders of magnitude larger than a tsunami caused by a comet impact. Chevron deposits evidence for comet impacts? However, the evidence of a submarine impact crater that supposedly produced the chevrons is speculative, and there are other possible options. Peter Bobrowsky, a senior research scientist in natural hazards at the Geological Survey of Canada, said ‘chevrons are fantastic features’ but megatsunamis are not the only interpretation of how chevrons form. Others include erosion and glaciation. Even for those who are favourable to the idea there are still many issues that need to be dealt with.8 Even if these chevrons do turn out to be evidence for ‘megatsunamis’ in the past, they are still not large enough to account for the biblical Flood described in the Bible. It is likely that they were associated with post-Flood catastrophism rather than the actual Flood event. Another important point is the supposed extent of the megatsunamis that result from these comet impacts. They can create chevrons that can extend for tens of kilometres inland and over 100 m high. However, the Flood deposited sediment kilometres thick all over the continents. Whether or not these chevrons were caused by megatsunamis from a comet impact, they are small in comparison to the global destruction of Noah’s Flood. Masse does a service by bringing attention to the fact that just about every culture has a flood myth. Interestingly, he poses a date for his flood (10 May 2807 BC) that is not all that different from the biblical date. However, there are two important flaws in his idea. Secondly, Masse is unreasonably selective in the way he uses the traditions. There are only 14 accounts out of the 175 he examined that refer to any significant heavenly event, and he identifies them with megatsunamis. What of the other 161 myths he examined? Where’s the reference to heavenly happenings in them? In reality, he has selected the accounts that fit best with his scenario and then pushed them as evidence for his comet impact hypothesis. It is highly subjective to ignore the majority of the accounts that agree on all the other factors which don’t support the comet impact hypothesis. The traditions tell of a great Flood that covered the whole earth, but not of a great comet impact. Meteorite impacts may have played a part in the destruction of the Flood but Genesis is silent on the matter. The biblical account does list the two major sources of the water, neither of which involves comets: ‘the fountains of the great deep broke forth’ and ‘the heavens were opened’. 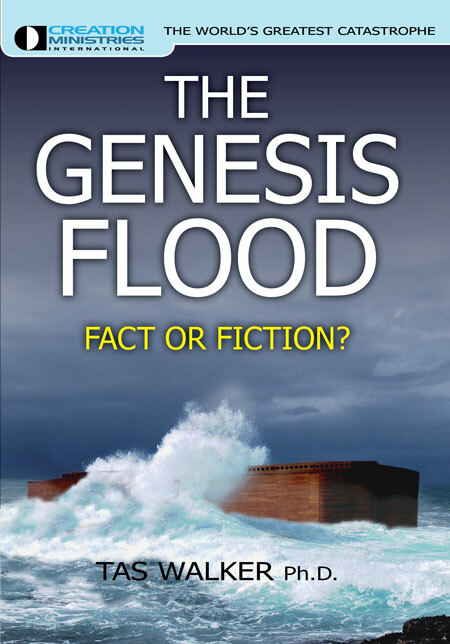 The global Flood traditions support the fact that a great Flood covered the whole earth. They don’t support the idea of a great comet impact. Rather than confirming the historicity of Noah’s Flood, ‘Noah’s comet’ contradicts the biblical data, at best explains only a local flood and overlooks the clear geological evidence for the truly global Flood. Did a meteor wipe out the dinosaurs? Carney, S., Did a comet cause the Great Flood? Discover, 15 November 2007. Return to Text. Blakeslee, S., Ancient crash, epic wave, New York Times, 14 November 2006. Return to Text. Faulkner, D., A biblically based cratering theory, Journal of Creation 13(1):100–104, 1999. Return to Text. Hartnett, J., The waters above , Journal of Creation 20(1):93–98, 2006. Return to Text. Spencer, W.R., Letters to the Editor; reply by Faulkner, D., Journal of Creation 14(1):46–49, 2000. Return to Text. Kelletat, D. and Scheffers, A., Chevron-shaped accumulations along the coastlines of Australia as potential tsunami evidences? Science of Tsunami Hazards 21(3):174–188, 2003; http://library.lanl.gov/tsunami/213/scheff.pdf. Return to Text. Dallas Abbott, D., Bryant, E.A., Gusiakov, V., Masse, W.B., Raveloson, A. and Razafindrakoto, H., Report of International Tsunami Expedition to Madagascar, August 28–September 12, 2006. Return to Text. Kelletat, D. and Scheffers, A., Chevron-shaped accumulations along the coastlines of Australia as potential tsunami evidences, Science of Tsunami Hazards, 21:174–188, 2003. Return to Text. Morris, J.D., Why does nearly every culture have a tradition of global Flood? Institute for Creation Research, BTG No.153b, September 2001. Return to Text. Osanai, N., A comparative study of the flood accounts in the Gilgamesh Epic and Genesis, MA Thesis, Wesley Biblical Seminary, USA, ch. 7, 2004. Return to Text. Sarfati, J., Noah’s Flood and the Gilgamesh Epic, Creation 28(4):12–17, 2006. Return to Text.